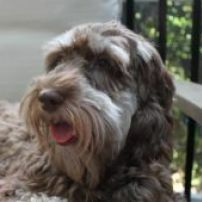 Australian Labradoodles USA provides breeding stock to qualified breeders If you are interested in a breeder from one of our lines, please contact us for more information. Hope, a stunning chocolate phantom girl who came to us from our DownUnder’s Rio, she has produced chocolates, blacks and apricot-creams and phantoms. She will have her next litter the end of May, 2016. 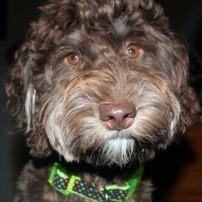 Jade is an absolutely gorgeous standard-sized multi-generation Australian Labradoodle. She is a bit over two years old and will had her current litter in March. Darby has one of the nicest fleece coats we have ever seen! Macie is one of our rare apricot cream girls. She is about 1 1/2 years old and hopefully will have her first litter in July. She is a true miniature multi-generational Australian Labradoodle. 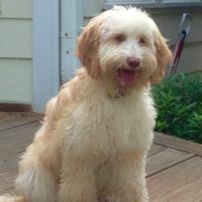 Rio, another one of our phantom Labradoodles, comes from our girl Kassie and our stud Sake. 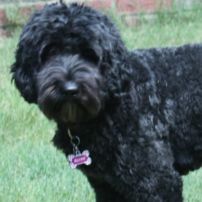 She is a small medium multi-generation Australian Labradoodle and carries apricot, cream, chocolates, phantoms and black puppies. ALAA registration number 28792 ! We carefully chose our first breeding dogs from Australia in 2002. We since have expanded our business and recently celebrated the birth of our 40th litter. When you select a puppy from us, you're getting the benefit of nearly 10 years of experience from one of the first Labradoodle breeders in North America. We began our in-house, hands-on breeding program in central Pennsylvania before moving to suburban North Carolina. We raise all of our puppies in our home, with daily socialization and attention. We place top priority on health, temperament and conformation to provide you with the best puppy possible. We have 3 litters on their way. We have Tika due any day now and she will have chocolates and blacks. Darby is also in whelp and will have gorgeous standards later this month. Java has also been bred and will have a multi colored litters of mini’s next month. Click HERE for more information, or CONTACT US now with inquiries. 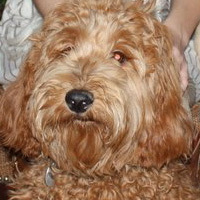 We provide support to our adopting families for the life of their Australian Labradoodle. We’ve built a knowledge base over our many years of experience that will prove helpful to puppy families in areas such as housebreaking, training, diet, exercise and grooming. Being one of the first breeders in the United States, we also have mentored many newer breeders in developing top quality breeding programs. Our dogs have soft, allergy-friendly fleece coats. If someone in your family has allergies, the multi-generation Labradoodle should be your first choice. Early-generation Labradoodles (called F1 and F1Bs) can be wonderful pets, but their coats can exacerbate allergy symptoms. We have years of experience providing puppies to families with allergies and would be happy to pair you with the perfect doodle. The bottom line: We want to help your family find the healthiest, friendliest companion imaginable.